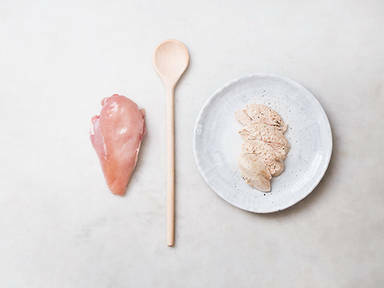 Poaching is a method for cooking chicken which is often overlooked in favor of traditional roasting or frying. However, poaching chicken gives a succulent finish and is a lot easier than one might think. First, add approx. 1 liter chicken stock to a large saucepan over a medium high heat and bring to a boil. Meanwhile, generously season the chicken with salt and pepper on both sides, then, using a large spoon, add the chicken to the boiling stock. Lower the heat, bring the stock to a simmer and allow the chicken to poach for approx. 2 min. then turn onto the other side. Repeat this process for approx. 10 – 14 min. until the chicken is opaque and cooked through. Place on a cutting board, slice into strips and season again before serving. Instead of cutting the chicken open to check that it is cooked, it’s also a good idea to invest in an electric thermometer so that you can just probe the chicken to check when it’s ready. All chicken should reach at least 165°F or 75°C when measured with a thermometer. Although you can enjoy this tender chicken with salad and in sandwiches, it also goes really well with Asian dishes, such as with rice, soy sauce and noodles. You can also add scallions and ginger to the chicken broth for a more intense flavor.